Or it could be an ‘F’ or a ‘T’, that Don Lee is a picture of concentration working on with the router. Now that the panels for Third Open 7828 at Rowsley are all cut out, the beading needs to move up the priority list. It will be a little while before the panels are all fixed in place and painted but then the panel joints will need to be covered by the beading. The main purpose of course is to prevent moisture getting into the joints, but a secondary purpose is to add to the attractive appearance of the coach. The junctions where the long straight sections of bead meet come in several different shapes, these are cut out on the bandsaw, fettled up a bit on the bobbin sander (for which we have a slightly rude name), then the edges are rounded off using the router on a former guide, one for each shape, made by Alan Taylor. 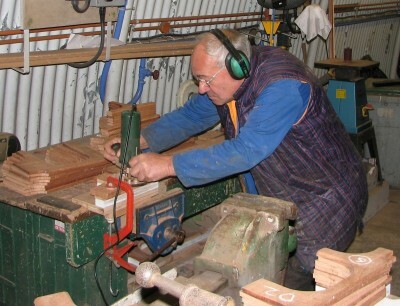 It’s a very noisy job which is why Don is wearing ear protection.